I wanted to tell you about the most wonderful fishing book I have just read. Called Tom’s book by Robert Olsen it is collection of truely evocative stories set mainly in the Wye valley. 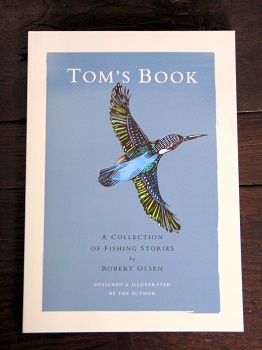 The book was written by Rob for his son Tom. It reminded me very much of Chris Yates at his best... and that is praise! And knowing the kind of people that read this forum, it’s a book I’m sure you would all love. I do read a lot of old and new fishing books and this is up there with the best and I really wanted to share that with you lot! Just wanted to say how much I enjoyed reading ‘Tom’s Book’ – great stories, wonderfully written. I absolutely love it, you write exactly as I fish and feel in my mind. I wanted to let you know that I received my copy of Tom’s book a couple of days ago (waited until the 16th) and have just finished reading it last night. I can only think of one thing to say. Just finished my copy and I don’t think I’ve read a fishing book so well written and which struck so many chords. The chapter on the close season, was spot on. I shared this with a few fishing friends and they all have the same sentiment. Anyway, I just thought I should let you know how much pleasure the book has given me and I’m sure I shall be reading it again when I get it back from my friends who all want a turn! I’m sure they will enjoy it as much as me. Free Packaging & Posting for a limited time only!